Clinicians, educators, and even parents sometimes need help getting the conversation started with teens, especially around topics of anxiety, depression, school, ADHD, LGBTQI, anger and body image. 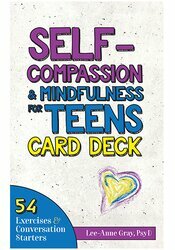 This card deck is a collection of 54 prompts using mindfulness, compassion, self-compassion, and kindness to tackle, discuss, and treat these challenging issues. Suitable for ages 13-99, these versatile cards stimulate conversation and promote mindful and kind ways of being.